Ease of booking. Hotel in good location for a stopover on our journey back to Calais. 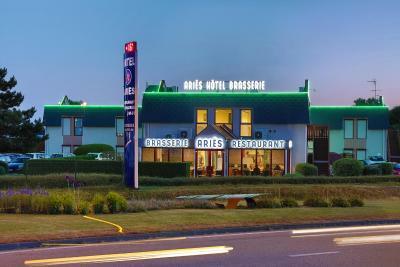 The hotel is easy to find on the road into Argentan and has ample parking. It is located within a retail park so offers shops and supermarkets but is not in the town itself. There is no restaurant but there is a Chinese buffet next door and restaurants in the town. The room was comfortable and breakfast was good. The hotel represented very good value for money. Clean and simple had Eurosport in the tv so we could catch up on MotoGP , under an hour from the ferry so arrived late and left early so really convenient!!! Excellent staff, made to feel welcome. The restaurant was way above expectations. L'emplacement de l'hôtel est un peu éloigné de la gare SNCF ; c'est dommage ! Le petit déjeuner manque cruellement de protéines, surtout en Normandie où les fromages de qualité, comme le lait également, sont délicieux et abondants et reconnus dans le monde entier ... Par ailleurs, la salle de bain est parfaite sauf qu'il manque un mode d'emploi pour utiliser l'arrivée de l'eau chaude comme froide ( tout le monde ne voyage pas régulièrement et n'a pas 20 ans...) ; c'est le même reproche pour le sèche-serviettes ! Calme de la chambre, confort de la literie, gentillesse de l'accueil. 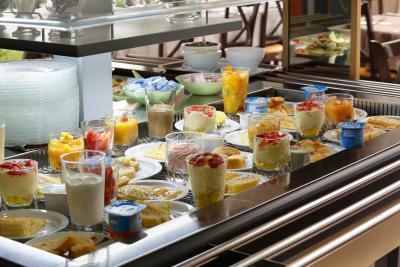 Bon petit-déjeuner sous forme de buffet à volonté. Hôtel bien situé proche du centre. 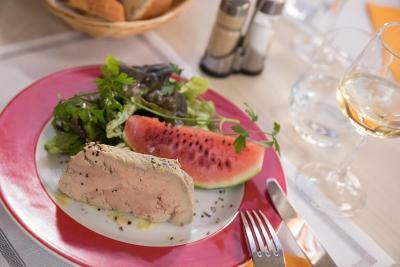 Personnel donnant volontiers des infos sur la ville, notamment les bons restos. 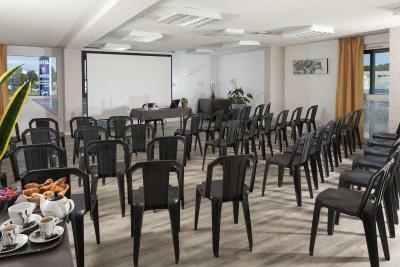 Hotel The Originals Argentan Ariès (ex Inter-Hotel) is located near the heart of the historic town of Argentan and features quality accommodations and a friendly, helpful staff. Guest rooms are equipped with modern amenities, flat-screen satellite TV and free WiFi internet access. The private bathroom features a walk-in shower, toilet and hairdryer. 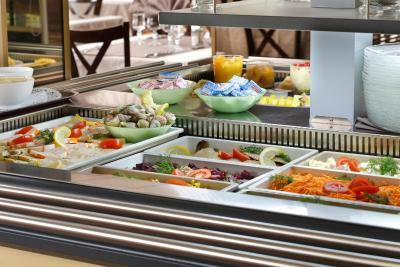 Enjoy regional cuisine in the hotels restaurant, or, in the summer months, take advantage of the barbecue facilities. With free parking on site and its ideal location, close to popular tourist destinations such as Deauville, Mont Saint-Michel and the landing beaches, Hotel The Originals Argentan Ariès (ex Inter-Hotel) is a perfect place for a your next Norman holiday. 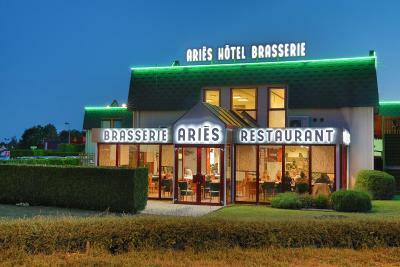 When would you like to stay at Hotel The Originals Argentan Ariès (ex Inter-Hotel)? The family room is made up of 2 connecting rooms fitted with 1 double bed, 2 single beds and equipped with 2 bathrooms. This double room features a desk, a flat-screen TV with satellite channels and a wardrobe. 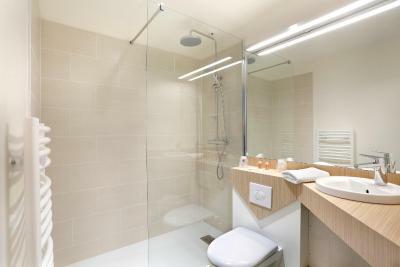 The bathroom comes with toilet, a walk-in shower, a hairdryer and a towel-dryer. House Rules Hotel The Originals Argentan Ariès (ex Inter-Hotel) takes special requests – add in the next step! ANCV Chèques-Vacances Hotel The Originals Argentan Ariès (ex Inter-Hotel) accepts these cards and reserves the right to temporarily hold an amount prior to arrival. Hotel The Originals Argentan Ariès (ex Inter-Hotel) accepts these cards and reserves the right to temporarily hold an amount prior to arrival. For arrivals on Friday and Saturday after 7:00 p.m. and on Sunday after 12:00 p.m., please call the hotel in advance to receive the access code. Dinner! Hotel restaurant was closed Saturday night. Had to go out and find a restaurant but this information should have been on website. The hotel is not manned all of the time and the self-registration process and coded key release system could be difficult. Very hot weather, no air conditioning. the reception area and the bedroom smelt musty and unpleasant. We decided not to remain there as the bedroom was dark and uncomfortably hot and smelly. The staff was extremely nice and helpful! Restaurant was closed, we weren't advised in advance. Travelling with a baby this was a convenient reason we booked to stay at hotel. Overpriced for the quality of hotel, functional at best if you just need a stopover for one night bed was uncomfortable.